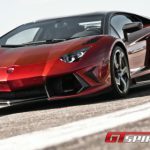 Just a year after its release at the Geneva Motor Show in 2011, the Lamborghini Murcielago replacement, the 2012 Lamborghini Aventador LP700-4, must be considered a resounding success for the Italian supercar brand. 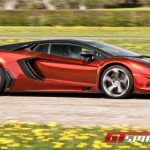 Its release, sales figures and the amount of positive comments on its design and capabilities goes to prove that the Lamborghini Aventador is here to stay for the coming years. 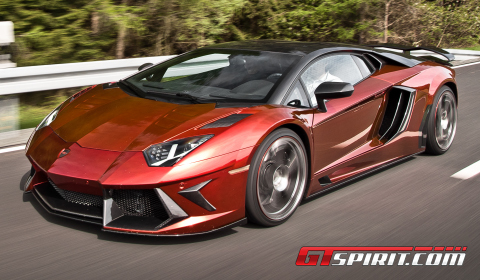 The Aventador is still in the early stages of its lifespan. 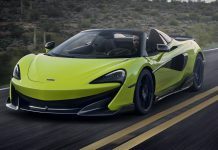 It started with the release of the coupe and, with a convertible in the making, several specialists around the world have started offering tuning packages for the 700hp-bull. 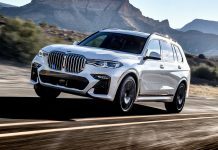 Without mentioning any names, there is one particular company from Brand in Germany, with a reputation for being the first to offer refinements and enhancements to newly introduced luxury and sports cars. The name is Mansory, a company owned by Iranian entrepreneur Kourosh Mansory and known for its extravagant programs for every type of sports car you can think of. Their latest creation is this, the Mansory Aventador. It was the most important introduction in the automobile tuning world at the 2012 Geneva Motor Show. The Germans were obviously the first ones to present their program for the bull from Sant’agata Bolognese and it is something special. We visited Kourosh and his team at their headquarters to take the Aventador for a ride and for a photo shoot at a local airfield. Thanks to an optimized engine-management system and a high performance exhaust system, both engine power and acceleration were improved inside the Mansory Aventador. The total power from its 12-cylinder engine has been lifted from 700hp to 754hp at 8,300rpm and 690Nm to 750Nm at 6,000rpm. The tweaked supercar accelerates from zero to 100km/h in 2.8 seconds, 0.1 seconds faster than stock. The top speed of 355km/h is 4km/h higher than the basic vehicle. During our drive and the max-215km/h high speed runs at the airport we did not experience any major differences to the setup of the award-winning supercar. 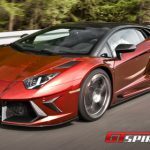 The Mansory Aventador power delivery via its V12 engine and seven-speed single-clutch ISR system feels similar to the stock setup we drove in Italy last year and the power increase is barely felt. The car still doesn’t like to drive slowly, it is rewardingly controllable in sport mode and offers its ripping-your-head-of-while-shifting mode in Corsa. The V12 makes a wonderful low-frequency roar at lower revs with an increase over 3,500rpm. Stay on the throttle beyond 5,000rpm, and it sounds like a screaming apocalypse from its stock exhaust system. Mansory did not replace the exhaust on this Aventador, there was simply no reason for it. It sounds wonderful! Open the stunning scissor doors and check the inside of the cockpit. You will find yourself surrounded by Italian refinements combined with German technology and the upgrades from Mansory. The fighter-styled starter button, which is protected by a red cover, has been moved to the roof while the center console received some carbon fiber trim. On the old position of the button it says Limited Edition and in front of the driver you now have a center cluster with a touch of carbon fiber. Quite a nice addition to the stock setup! 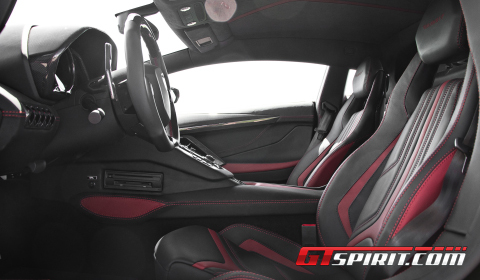 Other refinements inside the cabin are treated leather for the seats and the dashboard, a newly designed airbag sports steering wheel with the Mansory logo and some non-slip aluminum pedals. The exterior is Mansory’s trademark! The team from Brand has their carbon fiber production facility in the Czech Republic. At this site they developed and produced the front body with its apron with bigger air inlets for improved ventilation of the front coolers. The new front lip and its daytime driving lights are combined with new front wings, as well as a newly designed bonnet with air inlets. The sides grow by 40 millimeters in width on the front axle and 50 millimeters on the rear axle. Newly designed side sill connect the front with the rear of the supercar where a new carbon fiber diffuser is integrated into the new carbon fiber rear apron and a carbon fiber rear wing is added to the electronically-operated rear wing. The body package is completed by exchanging the roof and engine compartment covers with carbon fiber parts. The ride and handling of the Aventador has been changed marginal due to the larger 20 inch wheels at the front and 21 inch at the rear. The ride of the stock Aventador is already quite firm. Mansory’s wheel setup hasn’t influenced this postively, on the contrary the firm ride has only become harder. Not too much, but enough that it’s felt through a short drive. 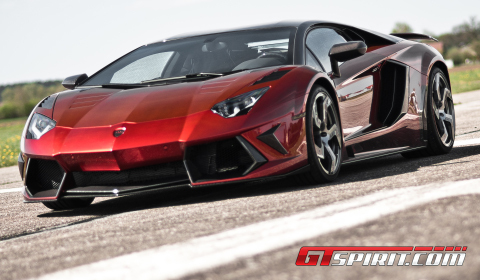 The overall looks of the Aventador are stunning to say the least. Mansory’s creations look way better on the street and at the airfield then on a stand at a carshow. 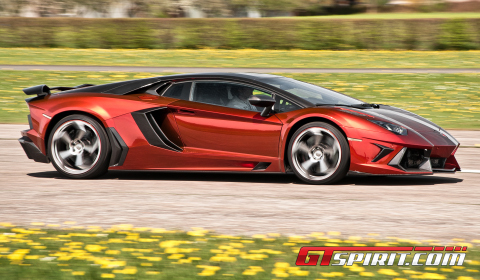 The extraordinary shiny red color livery combined with the new wheels with carbon fiber inlays and visible carbon fiber body work make the supercar look more nimble, shorter and a lot more aggressive. Especially the side and front profile and the interior upgrades are highly desirable and our personal favorites. The rear is a bit too much in our opinion. Losing the carbon fiber inserts in the rear outlets would enhance the looks of the rear considerably. Even though the stock Aventador is one of the best looking supercars out there, Mansory managed to create a package of what a future Aventador SuperVeloce could look like. 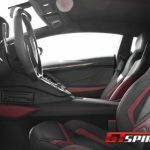 It provides the Mansory customer with an option to differentiate him- or herself from the vast amount of stock Aventadors currently flooding the market at a reasonable high pace. Those people can choose from the list of options and create themselves something unique and extraordinary in a world where individualism is a rule rather than an exception.